I love tech, and with each day it seems that we see something cool and totally new. But then, sometimes I run across things that remind me that some things we think are new started a long time ago. This time around, the reminder comes courtesy of John Glassie in A Man of Misconceptions: The Life Of An Eccentric In An Age of Change. The book is a biography of Athanasius Kircher, a Jesuit priest and scholar who lived and worked throughout Europe in the turbulent 17th century. Kircher is a fascinating and eccentric guy. He was a linguist and natural philosopher (what we now call a scientist) working in the turbulent dawn of the scientific revolution. He was on board with the notion of measurement and observation-based science, yet so steeped in traditional explanations of physical and medical phenomena that he never really committed to either one fully. He did some genius stuff, but also got many things completely wrong. Kircher lived in one of the the artistic capitals of Europe (Rome) on the heels of Palestrina (often regarded as the greatest of European Catholic composers). Yet, he thought that the music he heard sucked. (That sounds familiar.) Glassie shares some great quotes from Kircher, where he complained of hearing “the same twittering, the same cluckings, the same phrases everywhere until you feel sick and angry.” He couldn’t avoid the “notable abuses and faults”. . .”amid so great a throng of musicians.” Indeed, he was appalled that “such wretched compositions, prone to so many errors and defects, should appear every day, often in the leading places.” (Glassie, 122) So, Athanasius, what do you really think? Basically, Magic Garageband instruments and loops, without the “playing it for you” part. 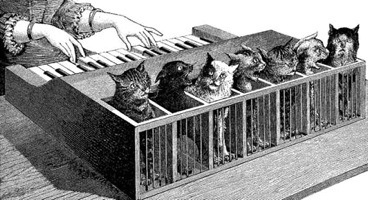 Basically, a real cat precursor to the electronic voice in Nyan cat or the sampler Dr. Demento’s 1989 dogs singing Jingle Bells (plus an extra helping of animal cruelty). These make we wonder how innovative we really are. Do we really have new ideas, or just better execution? It is easy to imagine that those who lived 400 years ago were somehow different from us, even simpleminded. But maybe they weren’t so different after all. Not sure, though, if that means we’re simpleminded or Kircher was ahead of his time. I’ll leave that for you to decide. Things Are More Modern-er Than Before…It’s Computers!